Like most other professional writers with a focus on books for kids and teens, I’m frequently asked by family and friends to look at their stories and/or help them get published. But, writing a cute story simply isn’t enough. Most amateurs aren’t aware of just how much time, effort, and work goes into getting published, especially these days. Even very short manuscripts can require a dozen rewrites, and of course you have to find a publisher interested enough to take a chance on your work. Writing for kids is not something you can do just because you’ve got a little retirement time on your hands. It takes knowledge about the industry and a commitment to the craft of writing. Even if you decide to opt for the self-published route, you still need to follow the previous steps, but in addition, you will also need to find the services of a professional editor, designer, and illustrator or photographer for your book’s cover (and, if necessary, interiors), possibly a computer expert (if you are going the e-book route) and you’ll still need someone to handle promotion and sales. If all this is sounding a little overwhelming, you may want to check out Harold Underdown’s “Getting Started” pages. 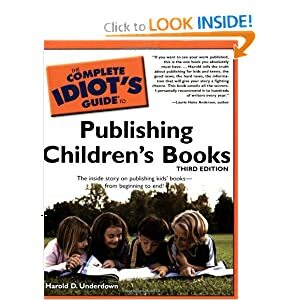 Underdown, is a former editor, and the author of The Complet Idiot’s Guide to Children’s Publishing.